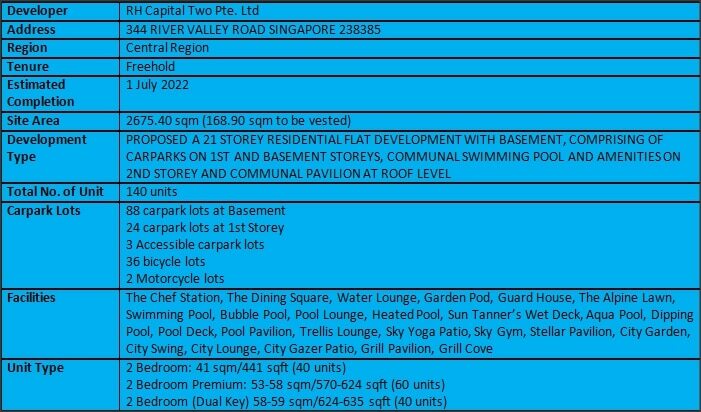 RV Altitude is an upcoming residential development that is located in the prime River Valley Estate, District 9, Core Central Region of the island. River Valley shares boundaries with Orchard in the north, Museum in the east, Tanglin in the west and Singapore River in the south. This area comprises mainly of high end private residential developments for high income sections of the population. The site is in between Wilmer House and The Verv @ RV. Opposite of RV Altitude across River Valley Road lies Yong An Park. The land plot was previously vacant and was successfully acquired by RH Capital Two Pte Ltd, a subsidiary of Singapore listed property developer Roxy-Pacific Holdings in Auguest 2017. This plot of land has a total size of approximately 2675 square metres with a gross plot ratio of 2.8. The land tenure of RV Altitude belongs to freehold. The development stands out with its superior attributes including its freehold tenure, District 9 address and close proximities to important amenities and wonderful attractions. Other developments that are within the development’s vicinity include Martin Modern, Martin Place Residences, Skyline 360 @ St Thomas Walk, New Futura, 8 Hullet, 111 Emerald Hills, Gramercy Park, The Nassim and The Rise @ Oxley. 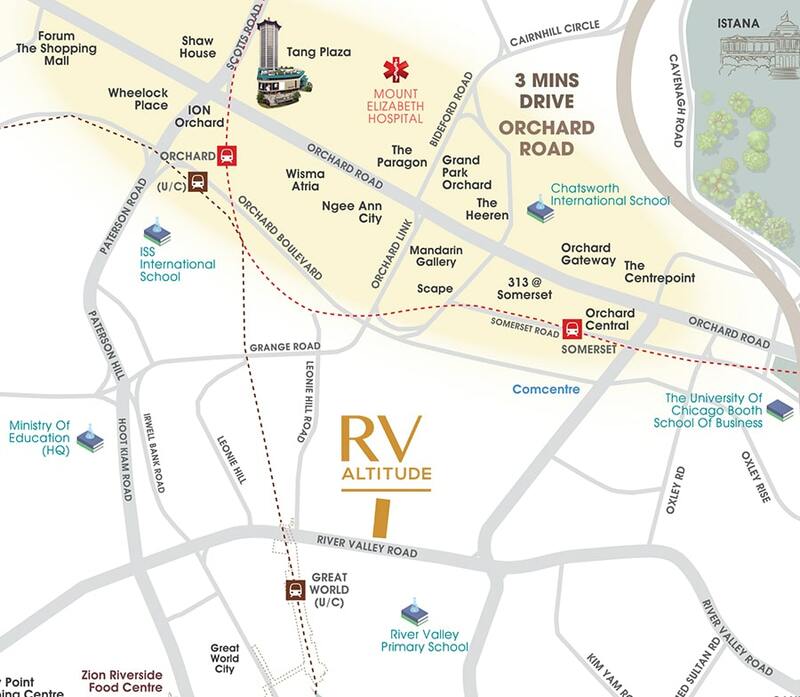 Currently, RV Altitude is approximately 600 m away from the Somerset MRT Station which operates the MRT North South Line. The MRT Station is just 1 train station away from the Dhoby Ghaut MRT Interchange Station toward Marina South Pier MRT Station direction, where the MRT Circle Line as well as the MRT North East Line is readily available. 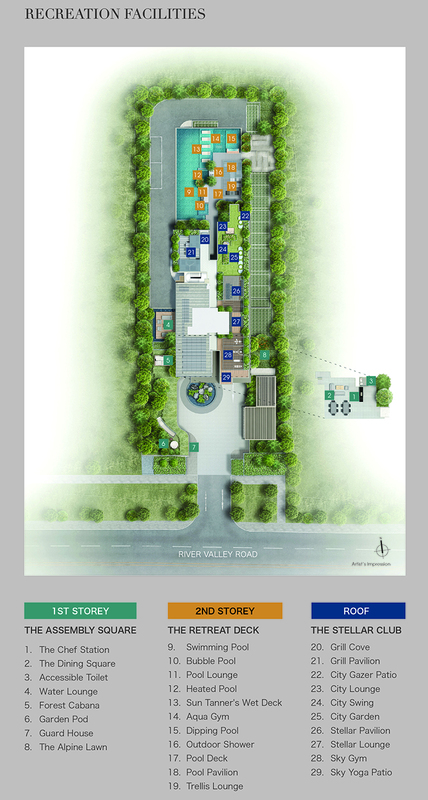 The development also enjoys close proximity, approximately 400 m away, from the upcoming Great World MRT Station. This station will be operating the MRT Thomson East Coast Line and is scheduled to start its operations in year 2021. The Thomson East Coast Line can link seamlessly to the the Woodlands North MRT station which will be near to the Johor Bahru-Singapore Rapid Transit System Singapore terminus. For drivers, RV Altitude is just approximately 5 minutes’ drive to the Orchard Shopping Belt. To the Central Business District, it is also just a mere 10 minutes’ drive. 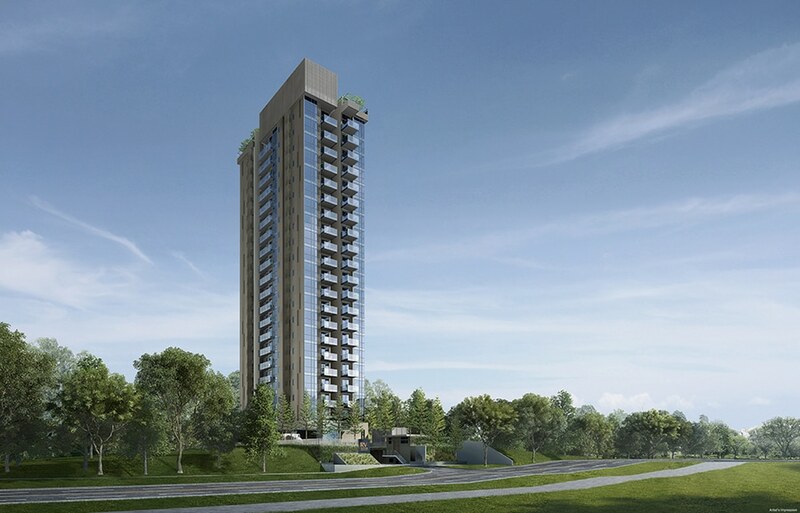 The development also enjoys great transport connectivity with the nearby major expressways such as the Central Expressway (CTE), making key areas such as Jurong Lake District and Changi Airport easily accessible. In terms of accessing to shopping, dining and leisure amenities, there will be no problem for future residents just need to take a short stroll to the Great World City, located just approximately 400 m away. The main Orchard Road shopping belt is also just a short distance away. Future residents can carry out their retail therapy in this Asia’s most famous 2.2km shopping street. It is every shopper’s paradise as it is home to fashion favourites, specialist stores and plentiful of lifestyle selections. The shopping belt is fringed by iconic shopping establishments, restaurants and hotels with retail, dining and entertainment options to suit all taste and budget. Nearby schools include River Valley Primary School, Alexandra Primary School, Saint Margaret’s Primary School, Anglo Chinese Junior School, Zhangde Primary School, Outram Secondary School, Gan Eng Seng Secondary School, School of The Arts (SOTA), Raffles Girls’ Secondary School, Crescent Girls’ Secondary School. RV Altitude is also close to tertiary institutions and international schools such as The University of Chicago Booth School of Business, Duke-NUS Graduate Medical School Singapore, Nanyang Academy of Fine Arts, Singapore Management University, Swedish Supplementary Education School, Finnish Supplementary School, Norwegian Supplementary School, Dimensions International College (City Campus), ISS International School (Elementary and Middle School Campus) and Chatsworth International School (Orchard Campus). Prime – It is located in the prestige District 9. Reputable Developer – It is joint venture between Guocoland and Hong Leong. Sought After – Its superior attributes are much wanted by both home buyers and investors. Want to be a proud owner of a unit in RV Altitude? Thank you for your interest in RV Altitude!